Amy KaufmanOur CEO, Bryan Salzmann, with Senator Rich Alloway and Summit Health COO John Massimilla having some fun at the ribbon cutting to commemorate the opening of 5th Avenue extended in Chambersburg, PA.
SuperUser AccountThe working group (aka Dream Team) behind the North Chambersburg Improvements Project! Amy KaufmanCongratulations, Hanover Hospital! The hospital has just been awarded a $2 million RACP grant to support its new cardiac catheterization unit - saving hundreds of thousands in healthcare costs, and most importantly, saving lives! Hanover Hospital received news on Friday of a grant to support its new Cardiac Catheterization Suite. Amy KaufmanGMS is thrilled to welcome Marissa Price to the Economic Development team! Marissa has more than a decade of experience in the public funding/economic development field and is an exceptional addition to our team. Amy KaufmanCongratulations to Waynesboro Borough on its $205,000 grant for the Memorial Park Rehabilitation Project! Amy KaufmanCongratulations to Carroll Valley Borough! Amy KaufmanCongratulations to The Goldenberg Group and Oak Tree Development Group! Much anticipated Multimodal Transportation Fund (MTF) grants will help construction critical transportation infrastructure for the redevelopment of the Logan Triangle in Philadelphia and Growth Opportunity Area #2 (the Outin Tract) in East Hempfield Township, Lancaster County. 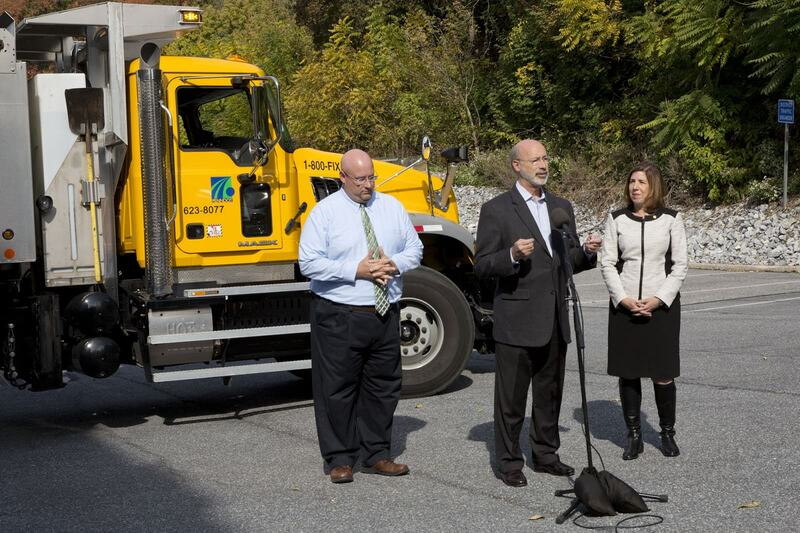 Gov Wolf and Sec Richards announced that 37 projects will receive $40 million in Multimodal Transportation Fund grants. Amy KaufmanThere they are folks - the innovators and advocates, making things happen. Officials broke ground on the North Chambersburg Improvements Project. Amy KaufmanNow let's move some dirt! CHAMBERSBURG, Pa. — Chambersburg Health Services, an affiliate of Summit Health, has awarded a bid to Fayetteville Contractors for the construction of what is being called the "North Chambersburg Improvements Project." Amy KaufmanDiesel fumes...no thank you. Congratulations to the Chambersburg Fire Dept. who was just awarded a $122,664 FEMA AFG grant! It will fund the installation of source capture exhaust systems at its two stations to prevent firefighters from inhaling harmful diesel fumes on the job. Amy KaufmanAnother excellent infrastructure project just weeks from construction! Thanks to Act 89, Senator Rich Alloway's fervent advocacy and forward-thinking Borough management and leadership, Waynesboro motorists will soon enjoy a smooth ride on Fairview and Welty. Amy KaufmanGMS is thrilled to welcome to the team, Christopher C. Houston, former Chief Counsel to DCED! Chris will serve as Senior Advisor to GMS' three service areas. Welcome aboard! Amy KaufmanGreat news, Folks! Starting March 1, 2016, the CFA will be accepting new grant applications for Act 13 Programs (Marcellus Legacy Fund) aimed at flood mitigation, abandoned mine drainage, greenway/trails and recreation, well plugging, sewage facilities planning and watershed restoration. Amy KaufmanCongratulations to the Borough of Chambersburg...again! In this challenging funding climate, BOC was just awarded a $150,000 DCNR C2P2 grant to install the long-awaited Nicholson Square Park - Phase I! Amy KaufmanCongratulations, Chambersburg! $4.1 Million CMAQ grant to improve signalization throughout the community, enhancing traffic flow and safety. CHAMBERSBURG &GT;&GT; The Borough of Chambersburg has a green light and $4.1 million from the Pennsylvania Department of Transportation to improve stop-and-go driving on the main corridors in town. Amy KaufmanOur dedicated, successful, GMS team is growing! Amy KaufmanThe following article may be of interest to our municipal clients, particularly those in south central Pennsylvania. Authored by our friend and colleague, Scott Wyland, Managing Shareholder at Salzmann Hughes, P.C., the Keystone Tap Fall 2015 issue outlines the ongoing and seemingly unaddressed issues with non-point source agricultural nutrient runoff in the Chesapeake Bay watershed. Robin Fitzpatrick, President of the ACIDA, presents the first RACP grant reimbursement to the Adams County Commissioners who provided bridge loan funding for site preparation at the Adams County Commerce Park to spur economic development in the center. An exceptional team and a fantastic client - congratulations. Amy KaufmanAt last! Congratulations to our client, The Goldenberg Group, a reputable, top-notch, talented team of real estate development professionals. Thanks to DCED, PennDOT, CFA & PIB for supporting this fantastic economic development project, and helping to overcome its extraordinary financial challenges.